Digging a deep end for your above ground pool is an excellent way to get more water depth in certain areas of the pool. Above ground pool deep ends can be dug so that one half the pool is shallow and the other half deep. They can also be dug so the center is the deepest area. Deep ends in above ground pools are not nearly as popular now as they once were, but it is still an option that gets used a lot. For the longest time sidewalls were only 48" tall, leaving about 42" of water in a normal above ground pool. The popularity of 52" and 54" sidewalls has decreased the need for deep ends but they are still wanted by many above ground pool owners. 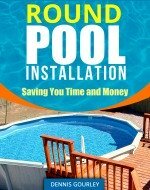 There is no set depth for above ground pool deep ends so if you are just looking for an extra few inches across the entire area of your pool this is a possibility. There are a couple of rules that apply to digging a deep end of any size and shape. At least a 1' 6" ledge should be left around the outer edge of the pool for the pool frame to sit on. This ledge is used to hold the pool cove and support the bottom rails and footplates, it is very important and should not be compromised. The other important consideration is the slope going into the deep area. This slope should, at all times, be gradual enough that sand can be packed onto it. Making the slopes too steep increases the difficulty of keeping sand in place to smooth and surface the area before installing the liner. A 52" sidewall will normally give you about 46 - 48 inches of water. Actual water depth is determined by subtracting three inches for the top of the pool. The pool cannot be filled all the way to the top of the sidewall, water would splash out over the top and the skimmer would not work. The water needs to be in the proper area of the skimmer for it to work effectively, meaning the water will be at least 3" from the top of the pool wall. You then need to subtract for the pool base. A sand base will use up 2-3 inches, Styrofoam will use 1-2 inches. Whatever pool base you are using, the thickness needs to be subtracted from your wall size. If you have a 52" sidewall, and a tall family, you may get more enjoyment out of a pool with 52" of actual water depth. Digging a deep end is the way to accomplish this. You would need to allow a foot and a half of ledge around the outer edge and then apply a gradual slope to an area 6" deeper than ground level. Doing this would allow most of your swimming area to be in a full 52" of water. That is just one example of how digging an above ground pool deep end can make your pool more enjoyable. Digging a deep end on an oval pool is another way to customize a pool to fit your needs. Oval pools have pressure plates that lay over the buttresses on both sides of the pool. This entire assembly needs to be left on level ground with at least another 6" of ledge before a deep end can be started. That usually means that on an oval pool you will need at least 3' of ledge on each side. The slope going into the deep area will be fairly steep, but not too steep, it still needs to hold the wet sand. The deepest part of the pool may wind up being just a small area, but very useful just the same. Learn more about deep ends on these pages. 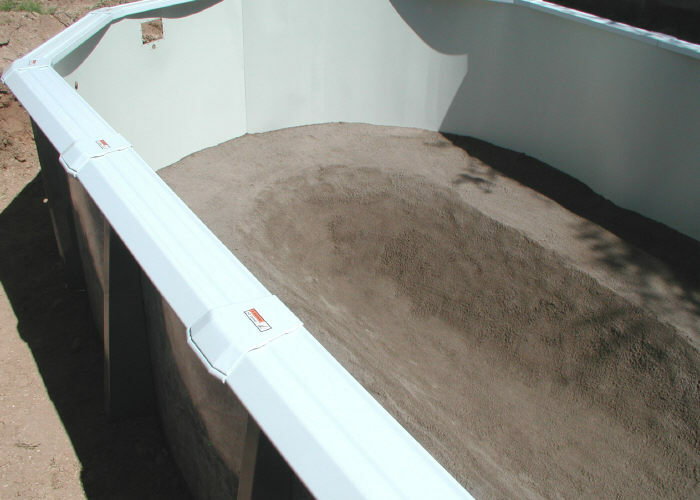 Any time you dig out the center area of an above ground pool you should use an expandable liner. Before installing the liner spend some time on our expandable liner installation page.